So how many of you, in the rush to get your 'Best of 2017' lists out before the holidays missed this one off? Thought so, which is a shame because this, the self-produced 2nd solo release from keyboard virtuoso Dave Kerzner is an absolute belter. Kerzner is one of rock's A-Listers, with a list of credits that reads like a roll call of everyone who's worth playing with, and it shows on this follow up to 2014's highly acclaimed New World. This is Champions League material with guest stars added in and ice cream on top. Kerzner leads playing keyboards, guitar and providing vocals, joined by Miami stalwarts Derek Cintron and Fernando Perdomo on drums and guitar/bass respectively; Randy McStine, who Kerzner played with in Lo-fi Resistance provides guitar pyrotechnics, and the most soulful ladies in rock, Durga and Lorelei McBroom (Pink Floyd) provide the backing vocals. If this wasn't enough talent Kerzner is again augmented by turns from Steve Hackett, Nick D'Virgilio, Nick Mason and Colin Edwin to name a few. What this turgid name dropping goes to show is that firstly, for those who might think this is a side project from Sound Of Contact, the band he founded with Simon Collins, this isn't a spotlight keyboard workout, it's very much a top flight high quality rock band in full flow and secondly that it's time to sit up and let Mr Kerzner take main stage. He clearly has recognition from his fellow musicians, the public should put their turkey legs and mince pies down and take notice. From the opening of Hypocrites lit up by Cintron's frantic drumming through to the magnum opus The Carnival Of Modern Life there is not a weak hand to be played. 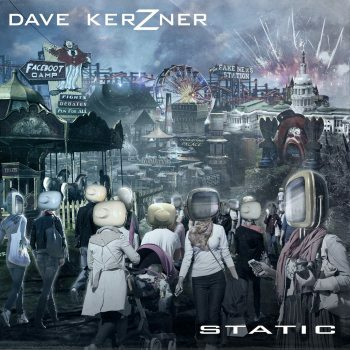 Kerzner expertly steers his way through progressive, AOR and Classic Rock themes. Complex ensemble playing is deliberately juxtaposed with ecstatic jams representing the struggle to find the truth amidst the constant background noise and chaos, the Static of the title track. This is a world where priorities, along with the truth are skewed. Kerzner often channels a Roger Waters-like barely suppressed sneer of anger and frustration which modulates into the clear-eyed resignation and empathy of Trust or the bouncing funk-rock protest of Millennium Man a satire of a small-town 'winner'. The closing suite The Carnival Of Modern Life presents a dysfunctional freak show, perhaps an allusion to ELP, with the crucial difference that instead of a dystopian future, this time the parade of misfits passing for entertainment are on your radios and TV screens, in your newspapers and walking down the streets where you live and work. Weighing in at 74 minutes, this is a behemoth of an album and one of the few works of its kind to channel its times so accurately without being worthy and preachy. Often one can listen to albums of this length, maximised for the CD format, and wish that some judicious editing had pruned it back to the classic single LP vinyl format. Not in this case. Constantly fresh and inventive, not afraid to mix genres, this is one of the best and most ambitious slabs of rock I have enjoyed for quite some time. With gigs lined up this year both as a solo artist and with Sound Of Contact and whispers of some more Sound Of Contact material for this year, Kerzner deserves to reach a much larger audience and become better known in the next 12 months. Didn't get it on your list for 2017? Put it down now for next year. You won't hear much better.